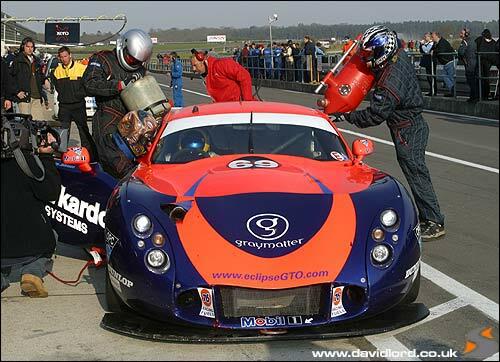 Round 2 of the 2003 British GT Championship saw a fantastic qualifying effort from Piers Johnson almost grab pole position in the Eclipse Motorsport TVR T400R - at a freezing cold Snetterton circuit in Norfolk. Only a last minute effort from Rollcentre Racing’s Martin Short succeeded in demoting the Eclipse car to second place, the Mosler driver edging Piers out by just 0.135 seconds. 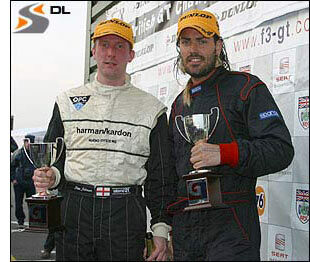 It was still a front row start though for starting driver Shane Lynch, eager to impress again after his heroics at Donington Park a fortnight before. In sharp contrast to Saturday’s conditions, Easter Sunday provided bright sunshine (albeit with a cool breeze developing), great news for the large crowd but less good for the drivers. A GT car gets very, very warm and this race would be more gruelling than usual. A two hour race beckoned, the longest so far held in the British Championship, and both drivers would need to be on the pace for a full 60 minutes each. 15 cars would take the start, with the Donington race winning Mosler starting from the back of the grid after a technical infringement in qualifying led to their times being disallowed. Bad news for Balfe Motorsport, but it would mean that Shane would only have one of the Moslers to worry about in the opening laps. Tom Herridge, starting driver in the pole-sitting Mosler, controlled the pace and kept an eye on fast starting Eclipse man. But when the lights went green it was Herridge who had the power down first, the Mosler leaving Shane Lynch to tuck in behind at the first turn, Riches. These two were already pulling clear of the chasing pack. First time round and Shane was right on the tail of the leader. Ominously back in seventh though, Jamie Derbyshire in the second Mosler had already scythed through the ‘Cup’ class runners and was now bearing down on the leaders: within just a few laps he would be on the tail of the Eclipse TVR. Up front Shane was making sure the leader didn’t get too comfortable, closing the gap and filling his mirrors with the newly re-liveried TVR. Traffic at the tricky Russell complex would allow Herridge a little breathing space, and would also allow Derbyshire to close up on the TVR. By Lap 13 the Mosler was right with him and now it was the TVR driver’s turn to be watching his mirrors, Shane now defending hard through the entire lap. Try as he might though, he was faced with the Mosler’s power advantage at a circuit like Snetterton, with its long straights and fast corners, and sure enough by lap 15 the race was a Mosler 1-2, but with Shane still pushing on hard in third. Jamie Derbyshire then reversed the order of the 1-2 with a great move up the inside into Russell on lap 19. 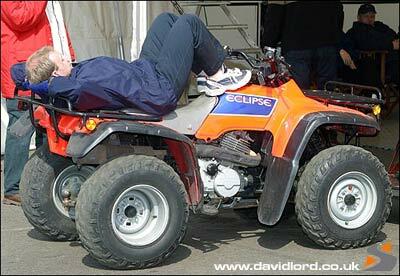 Shane was trying all he could to hang on to the leaders, but was struggling with an ignition switch that kept popping out. On lap 19 it finally caught him out, cutting out at an awkward moment and, momentarily without power steering, the TVR took to the grass. No damage, but ground lost to the leaders. But worse was to come for #69, because the air intake of the TVR was blocked with grass and the engine temperature began to rise. At 26 minutes, Team Manager John Griffiths called Shane in for a quick clean up job, but with a radio that had also given up the ghost, probably as a result of the same problem that had caused the original ‘off’, the team were unable to remind Shane of the pit lane speed limit. A somewhat spirited exit from the stop was caught by the pit lane stewards and an inevitable 10 second stop-go penalty board greeted Shane next time around: the chase for the lead was over for Eclipse. 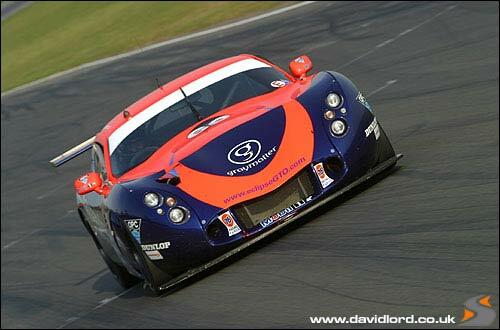 As the TVR pitted again, 2002 team mate Ben McLoughlin was halfway up the pitlane making unmistakable “Slow Down! !” gestures. Shane got the message and rejoined in sixth place, with the leader bearing down on him to put him a full lap down. With just 30 minutes gone, resistance was futile and Shane let the leader by. He hadn’t given up though, far from it. Remember this was only 25% race distance. He was closing up on the Marcos ahead rapidly. At the halfway point Shane joined the rest of the leading runners in stopping for fuel and a driver handover to Piers Johnson. The Championship rules dictate that a fuel stop should take a full two minutes, a measure introduced to ensure that teams don’t run the risk of a possibly disastrous fuel spillage. Job done by John Griffiths and the crew and Piers was out and away in pursuit of the second TVR ahead, Richard Stanton at the wheel. With the driver changes complete, Shaun Balfe in the red Mosler led Martin Short in the Blue car, with Stanton and Piers Johnson battling for third place. It looked like going Richard Stanton’s way, because a growing understeer problem for the chasing Eclipse car wasn’t helping matters. A repeat podium finish was looking less likely by the minute. With 25 minutes to go however, Richard Stanton’s pace dropped dramatically. Laps in the 1:09s had suddenly become 1:17 then 1:13. Piers saw his chance and put on the pressure. Stanton responded and the pace increased again, but a lap or so later, with 20 minutes to go, the vibration that Stanton had detected finally told and something let go. “I’m not sure whether it was the diff. or the drive shaft,” he said straight afterwards. 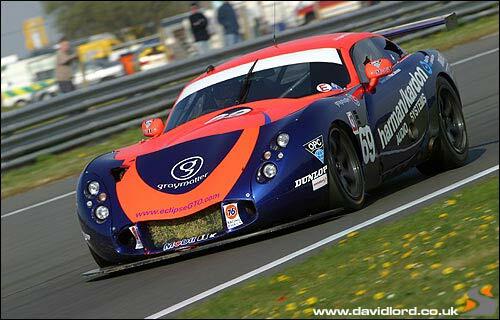 Either way the effect was the same, the third placed TVR lost drive and pulled over to the side of the track, out of the race. Piers swept through into third place and was now under no pressure from behind: if the car kept going that podium finish would be secured. At the flag, after 101 laps of the circuit, it was a win for Jamie Derbyshire and Shaun Balfe, two out of two for Red #22. Short and Herridge powered home second with Piers Johnson and Shane Lynch an excellent third. Two races and two podium finishes for Eclipse Motorsport so far this season, a good start and with round three in three weeks time at Knockhill, scene of a race ‘win’ for the team last season, only to have the victory withdrawn after a minor technical problem immediately afterwards, there is unfinished business there, full in the knowledge that the TVR T400R is now reliable as well as quick. 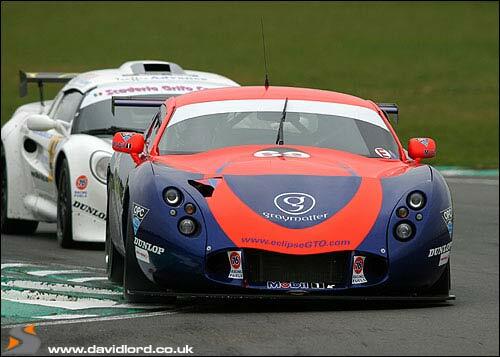 Will the twisty little circuit and the two x 40 minute sprint race format allow the TVR to get closer still to the Moslers? We’ll know the answer on May 11.